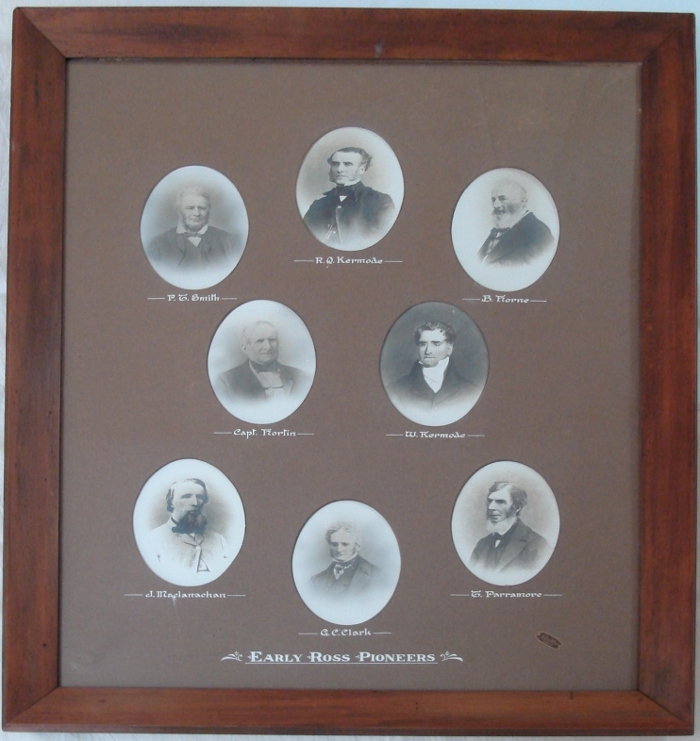 This composite picture of early Ross pioneers is comprised of eight small sepia-toned photographic portraits, with the name of each pioneer. The title text along the bottom is ‘Early Ross Pioneers’. All the text on the picture is hand written in a decorative script in white ink. The collection is mounted behind glass in a bevelled wooden frame. Handwritten on the backing board is the ‘2nd June 1921, D.R. Davis, Council Clerk’. The portraits have been framed and mounted by J.W. Beattie studio in Hobart, and is 740mm x 585mm. The scale of each portrait is approximatly 140mm x 100mm. The portraits and frame are in good conditions. All pioneers pursued strong agricultural interests, particularly in the wool industry. The Kermode family in particular were seen as instrumental in developing the industry, establishing a Saxon merino stud in the late 1820s and introducing a system of irrigation to the district that allowed the development of pastures and made the area more productive. Robert Quale Kermode exhibited wool from his sheep at the Paris Exhibition from 1855 and was awarded medals for his exhibits. J. Maclanachan, P. T. Smith, G.C. Clarke were instrumental in the early years of the Midlands Agricultural Association. Several of the pioneers, namely R.Q. Kermode, P.T. Smith and J. Maclanachan served one or more terms as members of parliament. G.C. Clarke, S. Horton and T. Parramore served on the inaugural Ross Council, which was formed in 1863. P.Tl Smith was Warden from 1867 to 18638 and T. Parramore was Warden n 1874. Horton and Smith has a strong interest in education, with Horton the driving force behind the establishment of Horton College and Smith setting up a trust to fund the training of teachers and improvements int he quality of education. Clarke was also involved in education, with his wife operating Ellenthorp Hall, a school for young ladies. Several of the pioneers also had an involvement in the law. B. Horne served as the resident Magistrate of the Ross district. P.T Smith, who had been admitted to the Supreme Court of Tasmania on his arrival in Hobart, was a Justice of the Peace and was active in the campaign to end transportation. R.Q. Kermode and J Maclanachan were also Justices of the Peace and were, along with Kermode’s father William, also involved in the anti-transportation league. Several of the pioneers also had strong ties to the church, particularly S. Horton and T. Parramore with the Wesleyan/Methodist Church in Ross, both making substantial financial contributions and devoting time and energy to its support. The foundation stone of the Ross Methodist Church was laid by the wives of the two gentlemen. one of the stained glass windows in the Church is in memory o T. Parramore and his wife Frances. The Kermode family was associated with the Anglican Church and donated the Caen stone pulpit to St Johns Church, Ross. Mr P.T. smith and Mr R.Q. Kermode were members of the Royal Society of Tasmania and gave valuable items to the Tasmanian Museum collection. The proceedings of the society record that “The Rev. W. l. Spicer after commenting on the great value to all future Tasmanian entomologists of the large cabinet presented by Mr. R. Kermode proposed a special vote of thanks to the donor. A similar vote was also due to Mr. P. T. Smith for the Microscope, a presentation for which any Society would feel indebted”. John Watts Beattie (1839 – 1930) arrived in Tasmania with his parents and brother in 1878. He began photographing the natural environment and became a full-time professional photographer in 1882. He is credited with a major role in shaping Tasmania’s visual image. He is also known for his museum of art and artifacts, which focused particularly on Port Arthur. The QVMAG, TMAG and the State Library hold a significant collection f his images.